Many subspecies and strains of oregano have been developed by humans over centuries for their unique flavors or other characteristics. Tastes range from spicy or astringent to more complicated and sweet. Oregano is an important culinary herb. It is particularly widely used in Turkish, Palestinian, Syrian, Greek, Portuguese, Spanish, Latin American, and Italian cuisine. It is the leaves that are used in cooking, and the dried herb is often more flavourful than the fresh. Culinary uses: Oregano is often used in tomato sauces, fried vegetables, and grilled meat. Together with basil, it contributes much to the distinctive character of many Italian dishes.The dish most commonly associated with oregano is pizza. It is commonly used by local chefs in southern Philippines when boiling carabao or cow meat to eliminate the odor of the meat, and to add a pleasant, spicy flavor. Oregano combines nicely with pickled olives, capers, and lovage leaves. Unlike most Italian herbs, oregano works with spicy foods, which are popular in southern Italy. Oregano is a widely used ingredient in Greek cuisine. Oregano adds flavor to Greek salad and is usually added to the lemon-olive oil sauce that accompanies many fish or meat barbecues and some casseroles. 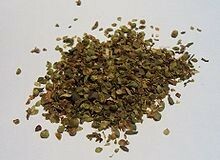 In Turkish Cuisine, oregano is mostly used for flavouring meat, especially for mutton and lamb. In barbecue and kebab restaurants, it can be usually found on table, together with paprika, salt and pepper. Historical uses: Hippocrates used oregano as an antiseptic as well as a cure for stomach and respiratory ailments. A Cretan oregano is still used today in Greece as a palliative for sore throat. Like Majoram, oregano 'warms' the body, and can help to get rid of lingering toxins or indigestible food. This 'warmth', in oregano tea, relieves bad colds. In addition, heated poultices of oregano applied to swelling and rheumatic sites, provide relief from pain. Colic is also reputed to benefit from the application of oregano. It is available by 50g, 250g and 500g.